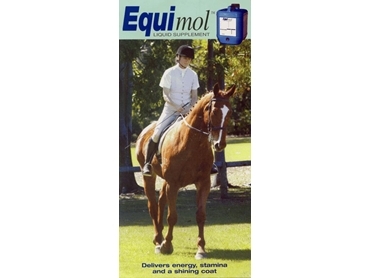 Produced specifically for horses and formulated to enhance dry feed rations and pastures, Equimol liquid feed supplements from Champion Liquid Feeds provide a palatable balanced mix of energy, minerals and vitamins plus Omega 3 oils. Omega-3 oils to improve skin and hair coat condition. A diet fortified with Equimol liquid supplements generally requires less grain and hay because starches, proteins and fats are better utilised in the natural feed. Equimol contains only the highest quality ingredients to fortify dry feeds for optimal nutrition that suits all stages of the equine life cycle. Equimol liquid feed supplements provide readily available energy and stamina, and a balanced nutrition for horses when fed in conjunction with a good feeding program.